Water is heavy. Where plumbing does not exist, it is the women and girls who usually carry the water. Pending the distance from a well, or in more developed areas, distance to the tap of a municipal water supply, women and girls will dedicate as little as 2-3 hours per week hauling water up to 7-8 hours each week. Water is heavy and the farther you go, the heavier water gets. 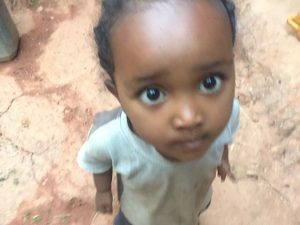 This little girl and her father who live outside of Gimbi, Ethiopia are two of the people whose life trajectory has been changed through funding provided by a donor to La Madre de los Pobres. 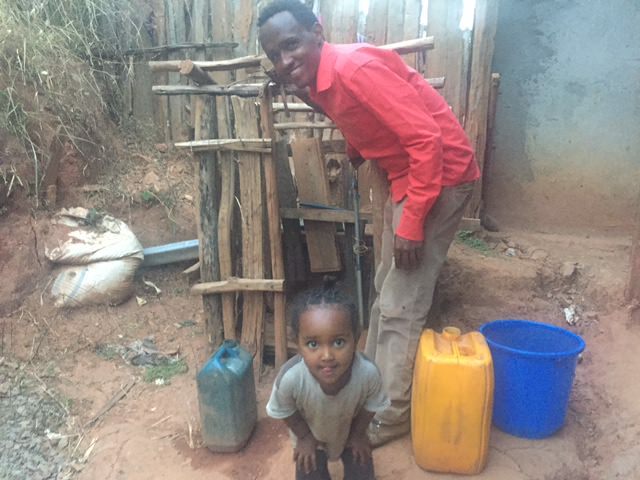 This sweet child pictured with her father now have access to this simple water tap in front of their mud floored house. This little girl’s mother has now gained 3-4 hours per week for study. The same is true for the neigboring families who can access this tap. 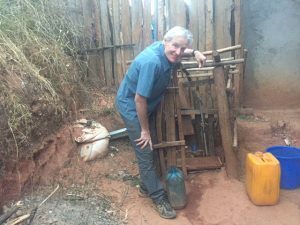 This simple little water project has and will improve lives. You should also know that the source of their water is now municipal so it is much cleaner and safer than untreated well water. Notice the yellow “gerry can”. They are everywhere in Ethiopia and other parts of Africa. This is how the majority of people bring water into their homes. When full each gerry can weighs about 40 pounds — heavier with every step. 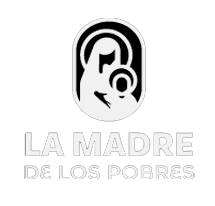 La Madre de los Pobres through the kindness of its supporters and donors invested less than $500 to make this project happen. We’re small and we’re hands on. You’ll notice one of our board members, Peter Wise standing with the water tap. When we find a project, we also find a way to check on it to make sure it happens. Peter and his wife were volunteering at two Catholic schools in nearby Gimbi (at their expense). La Madre de los Pobres asked Peter to include in his trip time to inspect the work and make sure it was operating as intended, that the donation was well used.